Here is another video I found showing a reporter filming inside of a mini-mart in Louisville Kentucky. All I have to say is that theses folks are really lucky. Please click on the link below to see the article and the video..
March 2012 - Tornadoes in the West.. I read about storms all day and night, I have to admit I obsess with them. I just looked at my phone and I noticed that I received a text at 3:30 am with storm warnings from the Storm Prediction Center last night(early morning). I did not even realize what time it was when I woke up to read this alert. My lifestyle has changed to where I read about storms that affect our Nation and parts of the world. I follow Text alerts, email subscriptions and The Weather Channel in the background, with this I study to be a more effective weather reporter. One of the great benefits of YouTube, is that you can watch many eye witness storm videos and it has impacted the internet with such popularity that it has made stars out of several storm chasers. 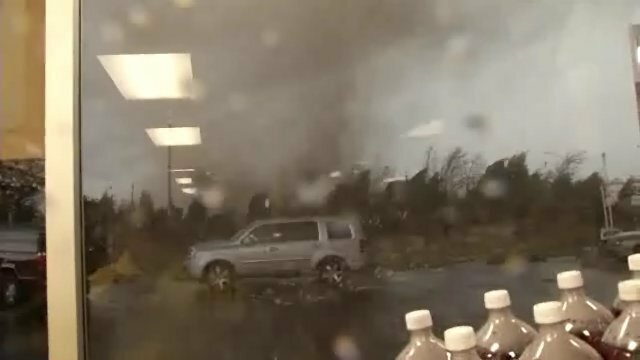 Here are several videos of recent tornado events that have hit our Mid America region within the last few days. Through many reports that I have read, I honestly lost count of the reported damage and casualties. I do not wish to glorify tornadoes giving the wrong idea. I am not a storm chaser, just a reporter to convey storm awareness. Thank goodness that in our area (SE PA) we do not have storms of this magnitude. However you can never know when a strong storm can impact our area. Lives have been lost in our area last year, from flooding form Irene and Lee. I want people to think about being prepared for bad weather. The most important thing to to stay weather aware by checking the news at least once a day. If you are not able to be near a TV or a computer, and own a smartphone, then I suggest you find a weather alert app. The experts always recommend everyone to buy a NOAA Weather Alert Radio. The problem with computers and smartphones is that they rely on plug in AC power and the internet to receive critical information. The moment we get hit by winds over 45 miles per hour, we can experience power outages which can prevent us from watching TV or using our desktop computer. Higher winds can knock out cellphone service, so buying a battery powered weather radio is the best and safest option. Please watch these videos, I have a feeling that we will face storms like Irene again in the not to distant future. As mentioned in the first segment, solar storms do have an effect on the Earth in many ways. These storms have an 11 year cycle where the next peak is in 2013. Because of our reliance on technology, these storms also have an impact on our power systems, electronics and communication systems. NOAA's SWPC also known as The Space Weather Prediction Center, is located in Boulder Colorado, is our early warning for Space Weather events. They warn us if there is high solar activity and provides space weather forecasts. Solar Storms also cause the effect known as the Aurora Borealis or Northern Lights, the image below shows how solar flare energy ionizes our upper atmosphere and causes this spectacular display. I have had discussions with a friend of mine about space weather and how it may be affecting our weather here on Earth. It seems hard to prove that space weather can affect us. Today I found an article that can help explain these phenomena. A Meteorologist from the Belgrade School of Meteorology explained that a solar storm or solar flare may have caused the oppressive weather that has been experienced in much of Europe recently. According to Milan Stevancevic, this solar energy is the cause of both life constructive and destructive effects on our planet. Solar flares can also cause earthquakes, and tornadoes with overall, increased rain and winds. The larger the solar eruption experienced, the more it will affect the winter and the following summer with a higher level of rain. Stevancevic stated that each solar flare creates proton radiation, which triggers ionization on entering the atmosphere. The solar storm from January 28th produced 15 minutes of radiation that was strong enough to equal 5 times of a routine x-ray, apparently clouds absorb this radiation. The proton radiation triggers particles that increase precipitation and particles that help fertilize the ground. So what about areas that have a thin or no ozone to protect them from this ionization? It seems that the proton radiation passes through our atmosphere and this is something that has naturally occurred.